With the Capitals announcement of Barry Trotz as their next head coach, the Hershey Bears should have their third coach in three seasons in the coming weeks. With Mike Haviland out of the picture, the Bears and Capitals will once again for a bench boss to man Washington’s AHL affiliate. Hershey has received over 60 applications for the job, including members of teams still competing in the postseason according to Bears’ GM Doug Yingst. The Capitals also promoted Brian MacLellan to General Manager, replacing George McPhee who headed Washington’s hockey operations for the past 17 seasons. MacLellan has had a vested interest in Hershey over the past several seasons when he was assistant General Manager for the Capitals, which could continue to evolve, which in turn will benefit the Bears at the AHL level. The Hockey Writers gives five names Hershey and Washington should consider as the near their decision. The hiring is made by the Washington Capitals, but GM Doug Yingst does have a say in the process. After being dismissed by the L.A. Kings after a first round playoff exit as the number one seed, Morris is looking for a coaching job for the first time in a long time. 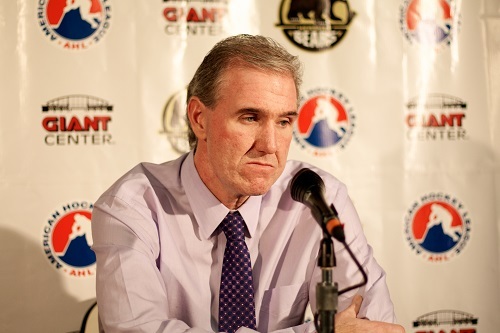 Following eight seasons as the Manchester Monarchs head coach, the 56 year old is on the market. He does have interest in Hershey, according to the Patriot News. Morris helped develop key prospects through the Kings’ system, most noticeably Dwight King, Tyler Toffoli and Tanner Pearson, who all have played key roles during L.A.’s playoff appearances the past few seasons and continue to do so. Morris should be the top option for Washington to coach the Bears. 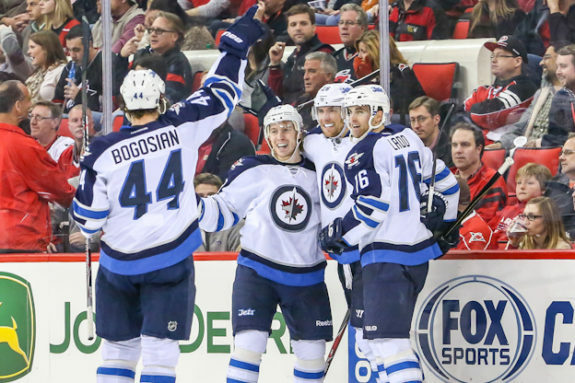 The former Winnipeg Jets head coach was fired earlier this season and has close connections to recently hired Capitals’ bench boss Barry Trotz. He could end up as one of Trotz’s assistants in Washington if he doesn’t become an AHL coach. Noel, 58, was also a player on Hershey’s 1979-80 team. He played in seven games for Washington that season as well and coaching his former team could interest Noel. He won AHL coach of the year during the 2003-04 campaign, leading the Norfolk Admirals to a Calder Cup championship. He coached the Columbus Blue Jackets briefly and the Winnpeg Jets for three seasons, finishing with an 80-79-18 record in Winnipeg prior to being dismissed. Paddock was promoted to assistant coach in Philadelphia just a few games into the season, but has a front office background as well. He’s unlikely to leave the Flyers for an AHL head coaching job, but Paddock is well worth the call. At 59 years old, Paddock is regarded as one of the best hockey minds in the business. He was Philadelphia’s assistant GM prior to joining the Flyers’ bench. Paddock joined the Flyers organization as the Phantoms head coach in 2008 and has played a big role in the development of Philadelphia’s forwards currently in the NHL today. He also was a head coach for the Ottawa Senators prior to joining the Phantoms coaching staff. Paddock was drafted as a player by the Capitals 37th overall in 1974 and played in 87 NHL games. He accumulated eight goals and 14 assists over that time period. Paddock was also a coach for the Hershey Bears prior to joining the Flyers organization, leading the Bears to a Calder Cup championship during the 1987-88 season. He coached the club for four seasons and earned the AHL’s top coaching award, the Louis A.R. Pieri Memorial Award when he coached Hershey to another championship. Lidster is currently coaching for the AHL’s Texas Stars and could have a head coaching position by the end of this summer. He’s in his second season with Texas, coaching under Stars head coach Willie Desjardins. Lidster and Desjardins have helped build a powerhouse in the tough Western Conference of the American Hockey League. Lidster previously coached for Canada’s Women National Team as an assistant coach from 2008-10, along with the Sanina Spirit of the OHL from 2004-05 as head coach. He previously was an assistant for the Medicine Hat Tigers of the Western Hockey League (WHL). Lidster is a lesser known name, but he’s had success in his brief time at the AHL level. Numerous young players have developed in the Stars system, most noticeably former Hershey Bears forward Travis Morin, a top scorer in the AHL this past regular season. The Marlies are currently facing Texas in the Western Conference playoffs, with the Stars holding a 2-1 lead. Gord Dineen is another potential Hershey Bears coaching candidate, but would have to wait till the end of the season to interview for Washington’s AHL affiliate. Dineen is in his fourth season behind the Marlies’ bench as an assistant coach, joining them in August 2009. He previously led Anaheim’s AHL affiliate, the Iowa Chops, as head coach during the 2008-09 campaign, guiding Iowa to a 33-33-4-10 record. He’s served as an assistant coach for four other AHL franchises excluding Toronto and Iowa, also coaching the Springfield Falcons (2003-04), the Utah Grizzlies (2004-05), the San Antonio Rampage (2005-06) and the Portland Pirates (2007-08).